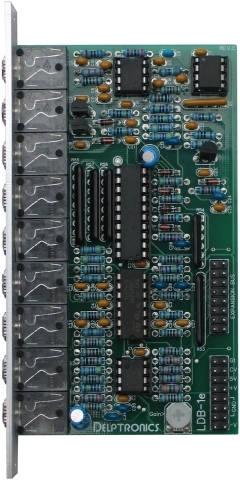 The LDB-1e Analog Drums Module and the LDB-1x Expansion Module have been replaced by the new LDB-2e and LDB-2x Modules. If you need an LDB-1x expansion module, Analogue Haven has them in stock. The LDB-1e “Little Drummer Boy” analog drums eurorack module is very compact. Just eight trigger inputs and one audio output in a 4 HP wide module. The module uses totally analog circuitry, not samples. Our goal was to recreate the warm sounds of the classic analog drum machines of the 80&apos;s, like the Roland TR-606 and TR-808. The circuitry of the LDB-1e uses the same principals as the classics and produces a very similar sound. Note that the open and closed hi-hat are the same instrument, so they have only one output/volume. The current draw is 15mA on +/- 12V, and 1.7mA on +5V. The LDB-1e requires +5V from your power bus. If your power bus does not supply +5V, you can add the capability with a third-party module like the the Doepfer A-100AD5, the Kilpatrick Audio Konverter, or the Erthenvar Freelunch. The LDB-1e requires a 16-pin power cable (which is included), not a 10-pin cable. If you are hearing no sounds, or if you are hearing strange squeals instead of drums, then the module is not getting the +5V that it needs. Some power busses supply +5V on all power jacks, all the time. However, sometimes, that is not the case. Some power busses require you to set a jumper to enable the +5V. Some cases (Monorocket for example) only supply the +5V on the top power bus, and not on the bottom one. 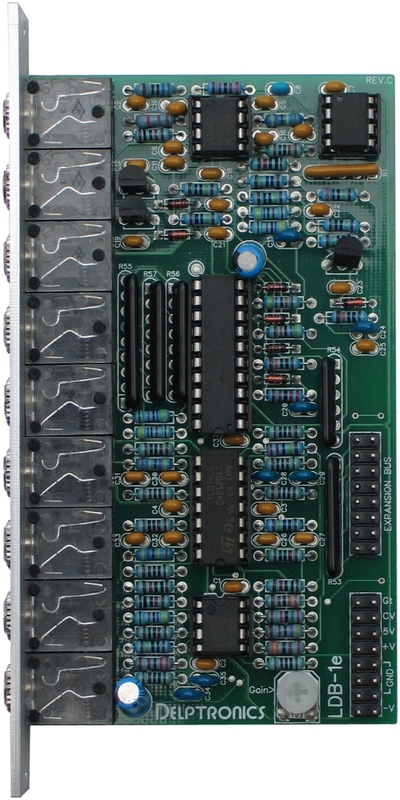 Doepfer power busses have wires with friction fit connectors that run from the power supply to the busboard, and the +5V wire is often not connected. If you have a voltmeter, you can test the pins on your power bus and verify whether or not they are supplying 5V. What&apos; the difference? The LDB-1e Eurorack Module contains just the drum sounds waiting to be triggered by any clock, LFO, or sequencer in your rack. The LDB-1 Drum Machine is a complete, stand-alone drum machine that includes the analog drum sounds as well as a sequencer, pattern memory, and lots of connectivity options.